Cancer occurs when cells in the body become abnormal and multiply without control or order. These cells form a growth of tissue, called a tumor. A tumor can be benign or malignant. A benign tumor is not cancerous and usually can be removed without growing back. A malignant tumor is cancerous and can invade and damage the body’s healthy tissues and organs. Head and neck cancer is a term used to describe a range of malignant (cancerous) tumors that can appear in or around the throat, larynx, nose, sinuses, and mouth. Most head and neck cancers are squamous cell carcinomas, meaning they begin in the flat, squamous cells that make up the thin, surface layer of the structures in the head and neck. If a cancer is limited to the squamous layer of cells, it is called carcinoma in situ. If the cancer has grown beyond this cell layer and moved into deeper tissue, then it is called invasive squamous cell carcinoma. There are five main types of head and neck cancer, named by the part of the body where they begin. For more information on each type, select a name below. A risk factor is anything that increases a person’s chance of developing a disease, including cancer. There are risk factors that can be controlled, such as smoking, and risk factors that cannot be controlled, such as age and family history. Although risk factors can influence disease, for many risk factors it is not known whether they actually cause the disease directly. Some people with several risk factors never develop the disease, while others with no known risk factors do. Knowing your risk factors and communicating them to your doctor may help you make more informed lifestyle and health-care choices. Eighty-five percent (85%) of head and neck cancer is linked to tobacco use. Using alcohol and tobacco together increases this risk even more. Recent research suggests that people who have used marijuana may be at higher risk for head and neck cancer. Prolonged sun exposure : This is especially linked to cancer in the lip area (as well as skin cancers of the head and neck and other chronically sun-exposed areas such as the hands). Gender : Men are two to three times more likely than women to develop head and neck cancer. However, the rate of head and neck cancer in women has been rising for several decades. Age : People over 40 are at higher risk for head and neck cancer. Race : Black people are more likely than white people to develop certain types of cancer of the head and neck. Poor oral hygiene : Poor oral hygiene has been suggested to increase the risk of head and neck cancer. Occupational inhalant : Exposure to asbestos, wood dust, paint fumes, and certain chemicals may increase a person’s risk of head and neck cancer. Poor nutrition : A diet low in A and B vitamins can raise a person’s risk of head and neck cancer. Gastroesophageal reflux disease (GERD) and laryngopharyngeal reflux disease (LPRD) : Reflux of stomach acid into the upper airway and throat may lead to head and neck cancer. Weakened immune system : A weakened immune system can raise a person’s risk of head and neck cancer. Human papillomavirus (HPV) : Exposure to this virus may be a risk factor for head and neck cancer. Exposure to second-hand smoke : Exposure to second-hand smoke may be a risk factor for head and neck cancer. Maintaining proper care of dentures. Poorly fitting dentures can trap tobacco and alcohol's cancer-causing substances. Denture wearers should have their dentures evaluated by a dentist at least every five years to ensure a good fit. Dentures should be removed every night and be cleaned and rinsed thoroughly every day. People with head and neck cancer often experience the following symptoms. Sometimes, people with head and neck cancer do not show any of these symptoms. Or, these symptoms may be similar to symptoms of other medical conditions. If you are concerned about a symptom on this list, please talk to your doctor. People who notice any warning signs should consult a doctor and/or dentist right away. When detected early, cancers of the head and neck have a much better chance of cure. Because many of these symptoms can be caused by other, noncancerous health conditions as well, it is important to receive regular health and dental screenings; this is particularly important for those people who routinely drink alcohol or currently use tobacco products or have used them in the past. In fact, people who use alcohol and tobacco should receive a general screening examination at least once a year. This is a simple, quick procedure in which the doctor looks in the nose, mouth, and throat for abnormalities and feels for lumps in the neck. If anything unusual is found, then the doctor will recommend a more extensive examination using one or more of the diagnostic procedures mentioned below. Smokers should also be enrolled in lung cancer screening programs. If a person shows symptoms and signs of head and neck cancer, the doctor will take a complete medical history, noting all symptoms and risk factors. The doctor may perform any of several types of tests that can help to make a definite diagnosis and determine the stage of the cancer (how far it has progressed). Physical examination : During a physical examination, the doctor feels for any lumps on the neck, lips, gums, and cheeks. Also, the doctor will inspect the nose, mouth, throat, and tongue for abnormalities, often using a light and a mirror for a clearer view. Blood and urine tests may be performed to help diagnose cancer. Endoscopy : A thin, flexible tube with an attached light and view lens is inserted through the mouth or nose to examine the head and neck areas. The examination has different names depending on the area of the body that is examined, such as laryngoscopy (larynx), pharyngoscopy (pharynx), or a nasopharyngoscopy (nasopharynx). It is performed using an anesthetic spray or general anesthesia to make the patient more comfortable. If tissue looks suspicious, the doctor will take a biopsy. Biopsy : A biopsy is the removal of a small amount of tissue for examination under a microscope. Other tests can suggest that cancer is present, but only a biopsy can make a definite diagnosis. The type of biopsy performed will depend on the location of the cancer. A biopsy that includes surrounding tissue and lymph nodes can determine if the cancer has spread to these areas. Fine needle aspiration : Cells are withdrawn using a thin needle inserted directly into the tumor. The cells are examined under a microscope for cancer cells (called cytologic examination). X-ray : A picture is taken of areas inside the body to help the doctor identify the presence of a tumor. A barium swallow may be required for identifying abnormalities along the swallowing passage. A special type of barium swallow called a modified barium swallow may be needed to evaluate difficulties. A dentist may also take x-rays of the teeth and mandible and maxilla, including a panorex (panoramic view). Signs of cancer may be followed up with a computed tomography (CT) scan. CT scan : A CT scan creates a three-dimensional picture of the inside of the body with an x-ray machine. A computer then combines these images into a detailed, cross-sectional view that shows any abnormalities or tumors. Magnetic resonance imaging (MRI) : An MRI uses magnetic fields, not x-rays, to produce detailed images of the body, especially images of soft tissue, such as the tonsils and base of the tongue. Ultrasound : In this test, a video image of the inside of the body is produced using sound waves. This test can detect the spread of cancer to the liver, or to the lymph nodes in the neck (cervical lymph nodes). Panorex : This is a rotating, or panoramic, x-ray of the upper and lower jawbones to detect cancer, or to evaluate teeth before radiation therapy or chemotherapy. Radionuclide bone scan : This procedure uses small amounts of radioactive material to determine whether the cancer has spread to the bones. Positron emission tomography (PET) scan : In a PET scan, radioactive sugar molecules are injected into the body. Cancer cells absorb sugar more quickly than normal cells, so they light up on the PET scan. PET scans are often used to complement information gathered from CT scan, MRI, and physical examination. The treatment of head and neck cancer depends on the size and location of the tumor, whether the cancer has spread, and the person's overall health. In many cases, a team of doctors will work with the patient to determine the best treatment plan. Many cancers of the head and neck can be cured, especially if they are found early. Although curing the cancer is the primary goal of treatment, preserving the function of the nearby nerves, organs, and tissues is also very important. When they plan treatment, doctors consider how treatment might affect a person's quality of life, such as how a person feels, looks, talks, eats, and breathes. Head and neck cancer specialists often form a multidisciplinary team to care for each patient, and an evaluation should be done before any treatment begins. The team may include medical and radiation oncologists; surgeons; otolaryngologists (ear, nose, and throat doctors); plastic surgeons; maxillofacial prosthodontists; dentists; physical therapists; speech pathologists; audiologists; psychiatrists; nurses; dietitians; and social workers. It is imperative that a comprehensive treatment plan is established prior to the start of therapy, and people may need to be seen by multiple specialists before a treatment plan is fully developed. There are three main treatment options for head and neck cancer: surgery, radiation therapy, and chemotherapy. One of these therapies, or a combination of them, may be used to treat the cancer. During surgery, the doctor performs an operation to remove the cancerous tumor and some of the healthy tissue around it (called a margin). The goal of surgery is to remove all of the tumor and leave negative margins (no trace of cancer in the healthy tissue). If the doctor suspects that the cancer has spread, then the doctor may remove lymph nodes in the neck, possibly causing stiffness in the shoulders afterward. Sometimes, it is not possible to completely remove the cancer; additional therapies might be necessary. Depending on the location, stage, and the type of the cancer, some people may need more than one operation to remove the cancer and to help restore the appearance and function of the tissues affected. If the surgery requires major tissue removal (for example, jaw, skin, pharynx, or tongue), plastic surgery may be used to replace the missing tissue. A prosthodontist may be able to make an artificial dental or facial part to restore the ability to swallow and speak. A speech pathologist may then be needed to assist the patient to swallow and communicate using new techniques or special equipment. Sometimes, surgery is followed by radiation treatment to destroy cancer cells not removed during surgery. Chemotherapy may or may not be given. Swelling of the mouth and throat area, making it difficult to breathe. Some patients may receive a temporary tracheostomy (a hole in the windpipe) to make breathing easier. Difficulty chewing or swallowing. A tube may be inserted in the stomach for feeding purposes. Facial disfigurement. Reconstructive surgery may be required to maintain appearance or body functions, such as chewing, swallowing, or breathing. Radiation therapy is the use of high-energy x-rays or other particles to kill cancer cells. Radiation can be administered in two ways: externally and internally. External-beam radiation therapy is conducted with a radiation beam aimed at the tumor. A new method of external radiation therapy, known as intensity modulated radiation therapy (IMRT), allows for more effective doses of radiation therapy to be delivered while reducing the damage to healthy cells and causing fewer side effects. Radiation therapy can be the main treatment for head and neck cancer, or used after surgery to destroy small pockets of cancer that cannot be removed surgically. Before beginning radiation treatment for any head and neck cancer, patients should receive a thorough examination from an oncologic dentist (a dentist with experience in treating people with head and neck cancer). Since radiation therapy can cause tooth decay, damaged teeth may need to be removed. Often, tooth decay can be prevented with proper treatment from a dentist before beginning treatment. People should also receive an evaluation from a speech pathologist who has experience treating people with head and neck cancer. Since radiation therapy can cause throat swelling and scarring, voice and swallowing are often affected. Radiation therapy also may cause a condition called hypothyroidism, in which the thyroid gland (located in the neck) slows down and causes the patient to feel tired and sluggish. 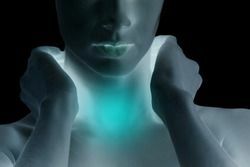 Every patient who receives radiation therapy to the neck area should have his or her thyroid checked regularly. Chemotherapy is the use of drugs to kill cancer cells. Chemotherapy may be given orally (by mouth); given intravenously (in a vein); injected either into a muscle, under the skin, or directly into the cancerous tumor; or applied onto the surface of the skin. Chemotherapy can be used in the initial treatment either neoadjuvant (before) or adjuvant (after) surgery, radiation therapy, or both. Many combined treatments (chemotherapy and radiation therapy) are performed as part of a clinical trial, which are research studies to find new treatments. The medications used to treat cancer are continually being evaluated. Talking with your doctor is often the best way to learn about the medications you’ve been prescribed, their purpose, and their potential side effects or interactions with other medications. Cancer and cancer treatment can cause a variety of side effects; some are easily controlled and others require specialized care. Below are some of the side effects that are more common to head and neck cancers and their treatments. Diarrhea : Diarrhea is frequent, loose, or watery bowel movements. It is a common side effect of certain chemotherapy or of radiation therapy to the pelvis, such as in women with uterine, cervical, or ovarian cancers. It can also be caused by certain tumors, such as pancreatic cancer. Difficulty chewing : Difficulty chewing can result from pain in the mouth, stiffness or pain in the jaw muscles, scarring, or problems with the teeth. Difficulty chewing can be a result of physical changes to the mouth, jaw, or tongue caused by the cancer itself, especially oral and oropharyngeal cancers, or it can be a side effect of cancer treatment, especially from radiation therapy and surgery. For patients who wear dentures, pain or swelling in the mouth or gums may make it temporarily impossible to wear dentures for chewing. Difficulty chewing meats, fruits, and vegetables can make it difficult to eat a nutritious diet. Difficulty swallowing (dysphagia) : Dysphagia occurs when a patient has trouble getting food or liquid to pass down the throat. Some patients may gag, cough, or choke when trying to swallow, while others experience pain or feel like food is stuck in the throat. Difficulty swallowing is a relatively common side effect of some cancer treatments. Potential side effects of cancer treatment that can cause swallowing difficulties include soreness, pain, or inflammation in the throat, esophagus, or mouth (mucositis); dry mouth from radiation treatment or chemotherapy; infections of the mouth or esophagus from radiation treatment or chemotherapy; swelling, scarring, or constriction of the throat or esophagus from radiation treatment or surgery; and physical changes to the mouth, jaw, throat, or esophagus as a result of surgery. Difficulty swallowing may be a long-term problem after treatment with radiation therapy. Dry mouth (xerostomia) : Xerostomia occurs when the salivary glands do not make enough saliva (spit) to keep the mouth moist. Because saliva is needed for chewing, swallowing, tasting, and talking, these activities may be more difficult with a dry mouth. Dry mouth can be caused by chemotherapy or radiation treatment, which can damage the salivary glands. Dry mouth caused by chemotherapy is usually temporary and normally clears up about two to eight weeks after treatment ends. Radiation treatment to the head, face, or neck can cause dry mouth and is most common with radiation treatment to the oral cavity to treat head and neck cancer. It can take six months or longer for the salivary glands to start producing saliva again after the end of treatment. Fatigue : Fatigue is extreme exhaustion or tiredness and is the most common problem patients with cancer experience. More than half of patients experience fatigue during chemotherapy or radiation therapy, and up to 70% of patients with advanced cancer experience fatigue. Patients who feel fatigue often say that even a small effort, such as walking across a room, can seem like too much. Fatigue can seriously affect family and other daily activities, can make patients avoid or skip cancer treatments, and may even affect the will to live. Hair loss (alopecia) : A potential side effect of radiation therapy and chemotherapy is hair loss. Radiation therapy and chemotherapy cause hair loss by damaging the hair follicles responsible for hair growth. Hair loss may occur throughout the body, including the head, face, arms, legs, underarms, and pubic area. The hair may fall out entirely, gradually, or in sections. In some cases, the hair will simply thin-sometimes unnoticeably-and may become duller and dryer. Losing one's hair can be a psychologically and emotionally challenging experience and can affect a patient's self-image and quality of life. However, the hair loss is usually temporary, and the hair often grows back. Hypercalcemia : Hypercalcemia is an unusually high level of calcium in the blood. Hypercalcemia can be life threatening and is the most common metabolic disorder associated with cancer, occurring in 10% to 20% of patients with cancer. While most of the calcium in the body is stored in the bones, about 1% of the body's calcium circulates in the bloodstream. Calcium is important for many bodily functions, including bone formation, muscle contractions, and nerve and brain function. Patients with hypercalcemia may experience loss of appetite, nausea and/or vomiting; constipation and abdominal pain; increased thirst and frequent urination; fatigue, weakness, and muscle pain; changes in mental status, including confusion, disorientation, and difficulty thinking; and headaches. Severe hypercalcemia can be associated with kidney stones, irregular heartbeat or heart attack, and eventually loss of consciousness and coma. Pain : Depending on the stage of disease, 30% to 75% of all patients experience pain from cancer. About 85% to 95% of cancer pain can be treated successfully. Pain can make other aspects of cancer seem worse, such as fatigue (tiredness), weakness, sleep disturbance, and confusion. Pain can come from the tumor itself or may be a result of cancer treatment. Pain from a tumor can be a result of the tumor growing and spreading to the bones or other organs and putting pressure on and damaging nerves. Pain from surgery is normal and may persist for months or years. Common procedures that cause pain afterward include mastectomy (removal of the breast and, occasionally, the surrounding tissue), chest surgery, neck surgery, and amputation of a limb (stump pain). Phantom pain is perceived pain in an organ or limb that has been removed. Pain may develop after radiation therapy and go away on its own. It can also develop months or years after treatment, especially after radiation therapy to the chest, breast, or spinal cord. Certain chemotherapeutic drugs can cause pain along with numbness in the fingers and toes. Usually this pain goes away when treatment is finished, but sometimes the damage can be permanent. Skin problems : The skin is an organ system that contains many nerves. Because of this, skin problems can be very painful. Many patients find skin problems especially difficult to cope with because the skin is on the outside of the body and visible to others. Because the skin protects the inside of the body from infection, skin problems can often lead to other serious problems. As with other side effects, prevention or early treatment is best. In other cases, treatment and wound care can often improve pain and quality of life. Skin problems can have many different causes, including chemotherapeutic drugs leaking out of the intravenous (IV) tube, which can cause pain or burning; peeling or burned skin caused by radiation therapy; pressure ulcers (bed sores) caused by constant pressure on one area of the body; and pruritus (itching) in patients with cancer, most often caused by leukemia, lymphoma, myeloma, or other cancers. Even after being diagnosed with cancer, quitting smoking is still critically important. Continuing to smoke during cancer treatment may decrease the effectiveness of treatment, cause second cancers to develop, and worsen treatment side effects, such as dryness and soreness. Even people who have recently quit are more likely to recover better than individuals who continue to smoke. After treatment, people should receive regular follow-up medical and dental examinations to check for signs of recurring cancer (cancer that comes back) or a secondary cancer (a different type of cancer), and to manage any late or long-term side effects from cancer treatment. Most recurrences happen in the first two or three years after diagnosis, so follow-up visits will be more frequent in the first two years. Diagnostic examinations may be repeated to detect recurrences or document the progress of current treatment. In some cases, testing and treatment must begin again. Rehabilitation is a major part of follow-up care after head and neck cancer treatment. People may receive physical therapy to maintain movement and the range of movements, and speech therapy to regain skills, such as speech and swallowing. Proper evaluation and treatment may often prevent long-term speech and swallowing problems. Supportive care to manage symptoms and maintain nutrition during and after treatment may be recommended. Some people may need to learn new ways to eat or to eat foods prepared differently. People may look different, feel tired, and be unable to talk or eat the way they used to. Many people experience depression. The health-care team can help people adjust and connect them with support services.